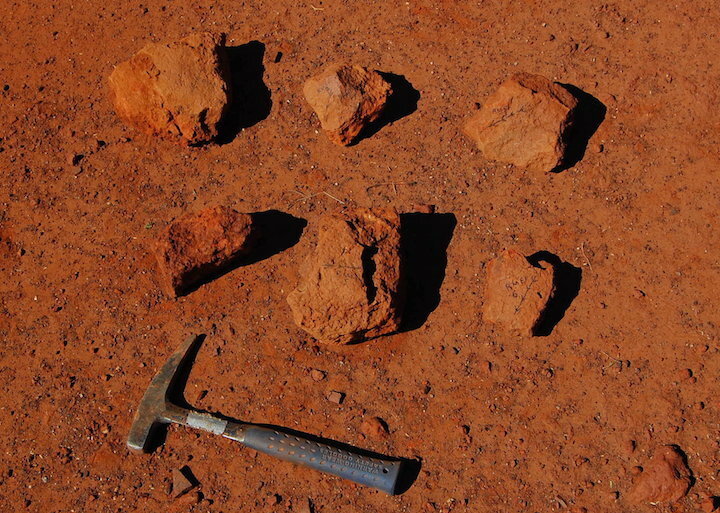 Chunks of clay excavated from Iron Age grain bins in South Africa. Early farmers burnt their clay huts and grain storage buildings in times of drought as part of a cleansing ritual, unknowingly locking the magnetic properties of the minerals in the clay into place. The study suggests that the magnetic field under southern Africa may not just be weird today, study co-author John Tarduno, who researches the Earth's magnetism at the University of Rochester in New York, told Live Science. It may be a longstanding hotspot for changes in the global magnetic field. "This may be the place that reversal started, at least reversals over the last millions of years," Tarduno said. The planet's magnetic field is generated by the churning of liquid iron in the core. Without the field, life on the planet would be much different, if not impossible: This invisible shield protects the Earth's surface from deadly cosmic radiation. Right now, the field is undergoing a weakening, and no one is sure why. The South Atlantic Anomaly, a region of the magnetic field that stretches from South Africa to Chile, is particularly weak, Tarduno said, so scientists have become interested in figuring out what might be going on in the core underneath that area. The problem is that before about 160 years or so ago, with the advent of magnetic observatories and (eventually) satellite observations, there weren't many records of what the magnetic field looked like in the Southern Hemisphere, Tarduno said. Ninety percent of the data that does exist comes from the northern half of the planet. To start to rectify that disparity, Tarduno and his team excavated clays from the Limpopo River Valley of Zimbabwe, South Africa, and Botswana. In times of drought hundreds to thousands of years ago, Bantu-speaking farmers would burn down their clay huts and grain bins in ritualistic ceremonies. Unbeknown to these ancient farmers, the fire heated the magnetic minerals in the clay and locked into place a record of the strength and orientation of the field at that time. Now, researchers can study those properties to find out what the magnetic field was doing at that moment in time. The excavations unearthed these burnt clays as long ago as A.D. 425, Tarduno said, providing the longest record yet of the magnetic field in southern Africa. The data show that the magnetic field experienced sudden directional shifts between A.D. 400 and 450, and then again between A.D. 750 and 800. Between about A.D. 1225 and 1550, the field noticeably weakened. The first two shifts might also indicate a weakened field, Tarduno said, but more research is needed to determine the magnetic intensity in those time frames. The researchers reported their findings Feb. 15 in the journal Geophysical Research Letters. What these shifts suggest is that what is going on in the Southern Hemisphere's magnetic field today may have happened before, Tarduno said. The field shifts may have to do with underlying processes churning deep beneath the Earth's surface, Tarduno said. In recent years, scientists have documented a weird patch of magnetic field below southern Africa at the boundary between the core and the mantle, where the polarity of the field is reversed. "That patch may be largely responsible for the decreasing magnetic field," Tarduno said. The patch is like an eddy in a stream, he said. As for what causes the eddy, it may be something odd about the mantle right above the core in that location, he said. The mantle under southern Africa is unusual, and possibly both hotter and denser than surrounding mantle, he said. "We think that is causing there to be changes in the flow of the iron [in the core] as it enters this region," Tarduno said. That could mean that southern Africa is the origin for magnetic field reversals, Tarduno said, though there's no guarantee that the field will flip now — the weakening could also dissipate, as it has in centuries past. Even if the field doesn't reverse, though, the weakening itself could have societal implications, Tarduno said. "These are not of the nature of disaster movies. That's not the point," he said. Instead, a weakening field could let more cosmic radiation hit the Earth, making infrastructure like the power grid more susceptible to geomagnetic storms and even changing atmospheric chemistry so that more UV rays could sneak through, causing increased risk for skin cancer in humans. "It's definitely something that we need to keep an eye on," Tarduno said.